The season for lovers starts on May 7 at the MAC/VAL! Frank Lamy and Nathalie de Blois, the exhibition organizers for, “Emporte-Moi/Sweep me off my feet”, declare: «the theme could initially appear uninteresting (…) but it has uncontested depth. Emotions linked to love are infinitely complex ». The exhibition’s approach thus deliberately evades irony to portray how contemporary artists pursue their investigations of imposed figures for the language of love, powerfully re-interpreted, incessantly swaying between enchantment and devastation. The exhibition ‘Emporte-moi/Sweep me off my feet’ brings together some two-score artists whose works give metaphorical expression to the movements and turbulence of being in love. Romantic and sentimental, it offers a meditation and map of the geography of the passions in some eighty works covering half a century of art-making. Deliberately turning its back on the irony pervading so much current art, this exhibition focuses on the value of emotion in pieces that, through the play of harmonised gazes and movements, by the whiff of a perfume, the gentleness of a caress or the passion of a declaration, evoke love’s power to bewitch or destroy, to sweep us off our feet in ways both delicious and painful, always at the risk of losing ourselves. Perhaps the true subject here is not so much love as that fundamental, deeply human appetite for the Other, for encounter: that need, search or quest for desire, ravishment, transport. Here, the Other represents a force that can throw us off balance and into the white waters of emotion. As mediums for thoughts, impulses, illusions and abandonments, the works assembled here express sorrow and solitude as much as they do hope and the overflowing feelings released by the encounter with a significant Other. Thus, not only do the works in this exhibition bear witness to a deep emotion linked with love, but they also tend to stir emotions in the viewer. ‘Emporte-moi/Sweep me off my feet’ evokes the question of amorous passion as event and medium for the vertiginous sensation of possibility. The season for lovers starts on May 7 at the MAC/VAL! Frank Lamy and Nathalie de Blois, the exhibition organizers for, “Emporte-Moi/Sweep me off my feet”, declare: «the theme could initially appear uninteresting (…) but it has uncontested depth. Emotions linked to love are infinitely complex ». The exhibition’s approach thus deliberately evades irony to portray how contemporary artists pursue their investigations of imposed figures for the language of love, powerfully re-interpreted, incessantly swaying between enchantment and devastation. 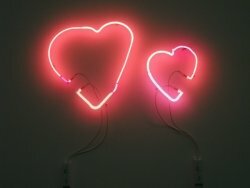 With this new group exhibition, the MAC/VAL didn’t really want to question LOVE but rather the fulfillingly free emotions. Videos, photographs, sculptures and installations from around forty well-known international artists, give us an original vision of love, cleverly pushing aside the pitfalls of romance. The dreamy exhibition title, “Emporte-Moi / Sweep me off my feet”, sets the tone – the works gathered at the MAC/VAL for this new season, evoking the intense upheavals resulting from love which undoubtedly stirs visitors’ emotions. Who better than the artists can interpret this huge repertoire of feelings with such mastery? Mixtures of couples, confidantes, rapture, passion, love songs, tears, kissing tales … individually take on a major role in the exhibit. So today, how can Love be defined in the modern world? How can you detect the outlines on this “Tenderness Map”? With this in mind, the curators chose works which seem obvious, for an immediate dialogue, to offer us this delicious elixir of powerful emotions. Their common objective is for a lasting impact, revealed by soft touches, like the slow gradual delight of a sweet treat, and never abandoning a certain mystery. The exhibit design fills wandering visitors with echoes, brief glimpses and surprises. This cartography of Love, or more precisely of feeling – at the MAC/VAL – is not just displayed like a series of turnkey experiences, but rather a subtle initiatory itinerary. Emotion is indeed the shock wave of this exhibition, commotion which creates empathy. Symbols and mythology are also present. 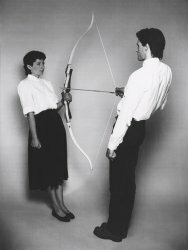 Rest Energy by Abramovic and Ulay – a present-day interpretation of Cupid - therefore become the visual signature of the exhibition. Standing on either side of the arc, the couple tightly pulls the bowstring, ready to send the arrow right into the heart of the paramour Marina Abramovic. Sweet love? Cruel love? The ambiguity of our feelings is the driving force of this exhibition – the euphoria of love often gives way to the difficulty of loving and being loved. Lovers lane is broken down into four mediums: photography (Pierre et Gilles, Bas jan Ader, Lygia Clark…), drawings (Jorinde Voigt,…) videos (Andy Warhol, François-Xavier Courrèges, Douglas Gordon, Sophie Calle, Cécile Paris…), installations (Ange Leccia, Cerith Wyn Evans…), sculptures (Kevin Francis Gray, Fionna Banner, David Altmejd…) and objects (Carsten Holler, Christelle Familiari, Jana Sterbak, Anne Brégeaut…) all present to retrace a grandiose and intimate epic covering the past four decades. Having resisted all tests, including that of time, the visitor, fully seized by emotion, has the rare opportunity to look beyond appearances – works which are not just visually present and appealing.